Give your kids a kick-start to learning their first programming language with this guide to HTML. Like many parents and teachers who are struggling to find resources and information to teach their children a programming language it can feel very overwhelming and confusing. 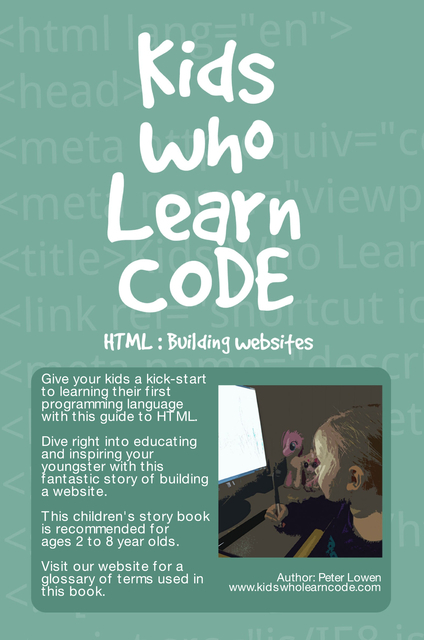 With this book, it takes away a lot of the fluff and your child will be consumed with the entertaining storytelling where you are placed alongside the Author's life as they create a website from start to finish and along the way you will be introduced to the HTML coding language throughout the journey. Dive right into educating and inspiring your youngster with this fantastic story of building a website. This children's story book is recommended for ages 2 to 8 year olds. all age levels in many schools all over the world! Visit our website for a full glossary of terms used in this book and many more resources. I was born in 1982, in Western Australia and I currently reside in the Wheatbelt town of Northam with my wonderful Wife Jodie and I have two kids, Kobe & Maddison. I started my first business in 2005 called Constructive Visual and began selling digital artwork, website design & hosting. I am passionate about designing websites. I find myself fascinated with learning, engaged with new technology and consumed with programming. I'm filled with creativity and I'm only just starting to learn how to release it. Enjoy my work!